• Gripping account of a decisive battle of the American Civil War • The victory that propelled Grant into the spotlight • Based on years of primary research The Battle of Champion Hill on 16 May 1863 was the decisive land engagement of the Vicksburg Campaign. 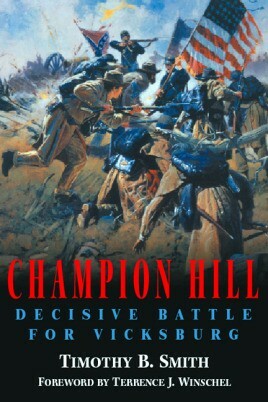 The Battle of Champion Hill on 16 May 1863 was the decisive land engagement of the Vicksburg Campaign. The fighting took place just twenty miles east of the river city, where the advance of General Ulysses S. Grant's Federal army attacked General John C. Pemberton's hastily gathered Confederates. The bloody fighting see-sawed back and forth until superior Union leadership broke apart the Southern line, sending Pemberton's army into headlong retreat. The victory on Mississippi's wooded hills sealed the fate of both Vicksburg and her large field army, propelled Grant into the national spotlight, and earned him the command of the entire US armed forces. Timothy Smith, who holds a Ph.D. from Mississippi State and works as a historian for the National Park Service, has written the definitive account of this long overlooked battle. His vivid prose is grounded upon years of primary research and is rich in analysis, strategic and tactical action, and character development. Champion Hill will become a classic Civil War battle study.